From professional photographers to novices, cameras have revolutionized how we take pictures today. Whereas any smartphone can carry out the primary task of capturing an image, a camera takes this a notch higher by giving you better pictures with enhanced optical zooms. 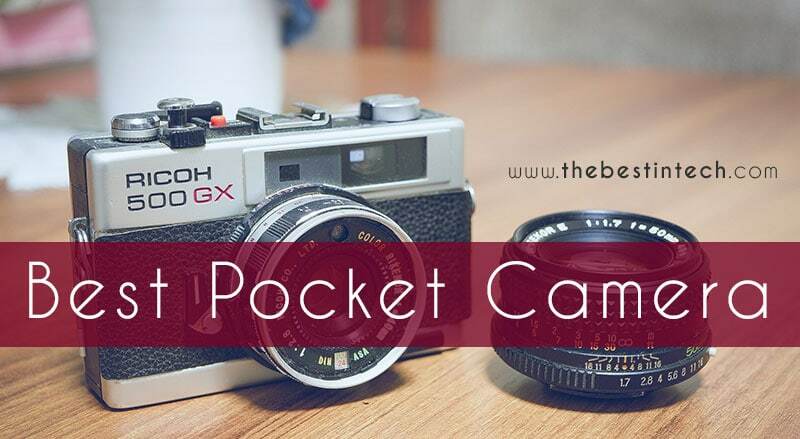 Also known as compact or point and shoot cameras, pocket cameras are small devices that can fit in your pocket. They offer more versatility, convenience and advanced features for boosted image quality. Interested in knowing which are the best pocket cameras in 2018? Read on for a full and candid review. If you are an outdoor enthusiast, you might want to check out a camera with a viewfinder to help you when taking shots against the harsh sunlight. Get large sensor cameras for display of pictures. 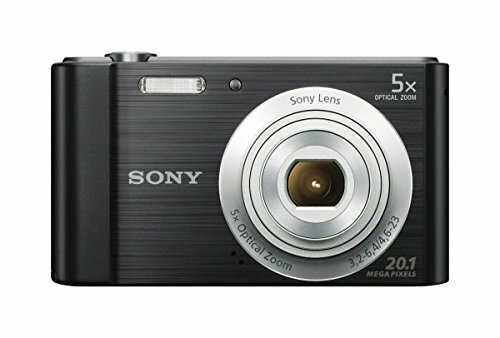 The SONY DSCW800/B is a Cybershot compact camera that is equal parts affordable and functional. Despite its low price, the pocket-size camera has an impressive 20.1 megapixels CCD sensor as well as HD 720p video recording for high-quality shots and videos. The 5x zoom with a 26-130 mm focal range is quite okay given that the target market is novice photographers. For this same reason, the compact camera has a simplified menu setting that will not trouble newbies as it hides all but the important settings. The W800 allows you to enjoy great shots even in troublesome environments such as nighttime and parties. Another great feature is that this slim camera allows you to be the boss. You get to control some features such as the white balance, exposure compensation, and ISO sensitivity. Let’s dig deeper into its features and see what the W800 is all about. Traditionally, the under $100 compact cameras are powered by the bulky and less appealing AA batteries which do not last very long, but the good news is that the W800 comes with proper rechargeable Li-ion batteries. Sleek styling with black and gray finishes. I’d like to mention that the finishing looks like steel, but it is indeed painted plastic thus you should exercise proper caution to avoid brushes and scratches. The camera weighs only 125g which is perfect as it can fit in your pocket. Simple controls that make the camera extremely easy to use. The W800 has a simple menu system with an Easy Mode setting that hides all the non-essential information for easy control. 20.1 megapixels sensor and 5x zoom for great images. The W800 is a good camera though some features might disappoint you if you are searching for a camera that does more than taking good pictures. For starters, the rear screen is pretty weak. It further has a low resolution and poor viewing angles. 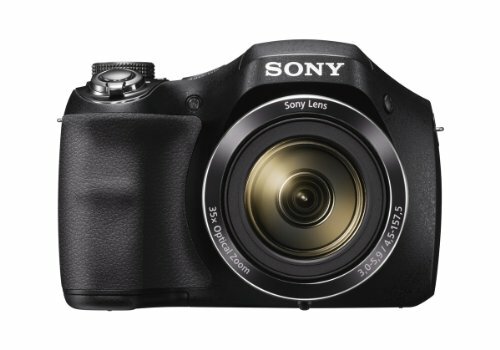 The Sony W800 is a smart compact camera that is simple to use and quite affordable. If you’re looking for a simple, compact camera that requires minimal control while taking high-quality photos and videos, this is your best bet. You might want to look at other better options if you desire a pocket camera with improved image quality and longer zooms. Canon is a well-known producer of imaging and optical products. It, therefore, comes as no shocker that the company has a few devices worth checking out in our top ten best pocket camera review. Let’s talk about the G9 X that has tongues wagging. The Canon Powershot G9 X II is an ultra-slim, pocketable compact camera with plenty of external controls and outstanding image quality. With its impressive fast 1.8 aperture at wide angle and round lens control dials, the G9X is a must-have for pocket camera enthusiasts. Read on to find out more on the features that make the G9 X II appealing. The Canon Powershot G9 has WiFi, NFC, and Bluetooth for easy sharing with other devices and social media. The G9 X II has a 3” touchscreen display. It boasts of a 20.2 megapixels BSI-CMOS sensor for spectacular shots. Its full HD video capture allows you to take great videos at the touch of a button. Let’s not ignore the spectacular design. 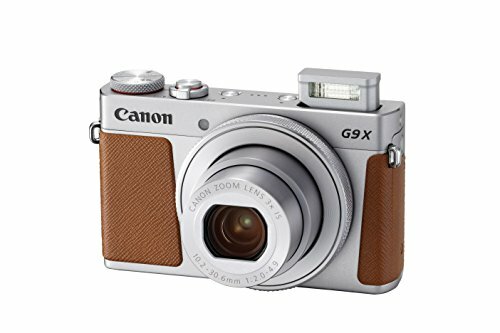 The G9 X II comes in a beautiful brown and silver finishes which only add to its marvelous features. Weighing 206g with the memory card and battery in place, the camera is light enough to slip into your pocket. It surpasses its predecessor, the G9 X, by coming with a much faster image processor. The G9 X II has a one-inch sensor that takes excellent shots in no time. An impressive 1/2000 in 30 seconds shutter is part of the bargain with this lovely pocket camera. Thanks to DGIC 7 image processor, the G9X II has an impressive continuous shooting. It further has a dual I.S image stabilization performance with up to 3.5 stops of correction. Unfortunately, even the good has its bad. The G9X II fails us with its limited physical controls and its unreliable autofocus in low-light conditions. If you are searching for a compact camera that gives you plenty of speed and proven image quality, then the G9X II is the ideal pocket camera for you. Do you enjoy taking everyday snaps, holiday pictures, and event images with your camera? The long zoom and compact body Powershot SX710 is an ideal companion. It is advanced but easy to use making it ideal for a variety of functions. The phenomenal camera boasts of a 30x optical zoom that can capture distant images and at wide angles. Its fast shooting rate is something we cannot overlook. 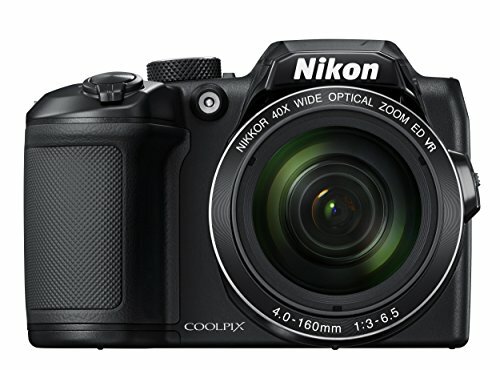 If you are in need of a compact camera that gives you spectacular shots, this is a good bargain. The WiFi-enabled camera has plenty to offer when it comes to design and features. Let’s find out what these are. It has a strong build and comfortable hand grip for easy handling. With a resolution of 20.3 megapixels, the magnificent SX710 promises great shots. It has a good zoom range of 30x which allows you to take distant images and wide-angle landscape photos. Further, the 60x zoom plus helps you capture small details as you get closer to the action. The DIGIC 6 Image processor will work to your favor by creating superior images with stunning detail. It is fast and powerful. The Zoom Framing Assist helps you create an optimum framing for your precious photos. The SX710 has an impressive 5-axis Intelligent IS for image stabilization. Backup or share your images simply and easily using WiFi and NFC. The SX710 has a Remote shooting feature that allows you to control your camera using your smartphone or tablet thus including yourself in group photos. You can sync to back up your precious with simple image backup. As usual, we have noted a few issues with the SX710. First, it does not produce great images under moderate ISO sensitivities which is a deal-breaker. For a device of its caliber, we’d expect that it comes with a viewfinder, but it does not. It further slows down significantly when the flash is on. 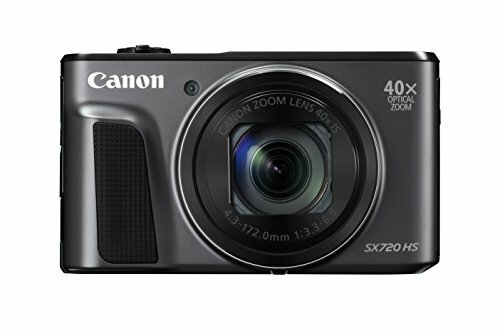 If you are looking for a high-powered, pocketable camera, the Canon Powershot SX710 is a worthy bargain. Besides being reasonably priced, it is a great investment if you enjoy taking videos and crisp, clear images. 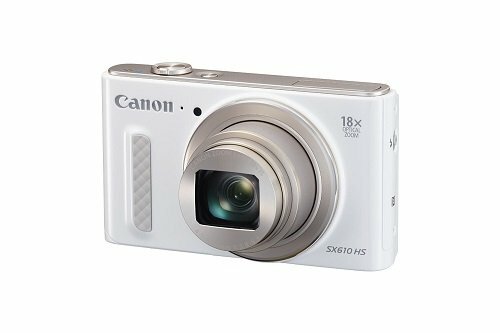 The CANON POWERSHOT SX610 is a stylish, pocket-sized camera that not only wows us with its sleek design but has the functionality to match. You can capture every single detail with its powerful 18x zoom. 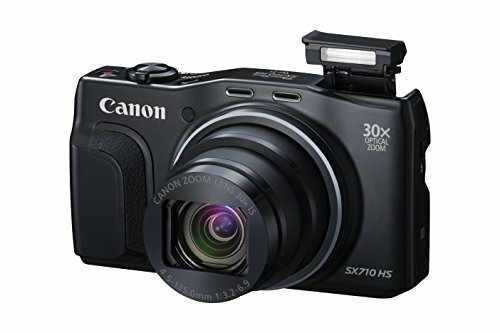 The Canon SX610 makes it to our top ten best pocket cameras in 2018 because of one salient and very tech-savvy feature- its WiFi connectivity. In a world where all our devices are interconnected, you will love the convenience that this feature brings along. With WiFi and NFC, you can seamlessly share your pictures and videos to your other devices and social media. You will appreciate the ultra slim and pocket-friendly design that the Canon SX610 comes in. It can easily fit into your pocket, so you don’t have to worry about having a bulky pocket camera on your safari. The 18x zoom allows you to capture crisp details for beautiful and high-quality photos. The camera comes with Intelligent IS which is a feature you will like as it gives you sharp photos and steady videos. This means that you will never get shaky photos even if you take them in low-light or are shooting at full zoom. You can easily share your videos and photos using WiFi. The easy, creative shooting allows you to be artistic and inventive. Shoot high-quality HD videos at the touch of a button. Its 25 mm ultra-wide angle allows you to take photos of large groups and scenery without worry. The Canon SX610 comes with an auto zoom for optical framing. You can easily track and find the faces of people even in a crowd for effortless people framing. The 20.2 Megapixels camera gives you great shots for your best memories. The Canon SX610 allows you to take clear pictures even in low-light without the need for a flash or tripod. Despite all the good the Canon SX610 can do, we have a few concerns. Let’s start with the fact that the 20.2 megapixel does little to enhance the image quality. The image quality really does suffer at moderate IPOs, and that is a big blow to an otherwise marvelous product. The CANON SX610 is a great pocket-size camera for those who desire a no-fuss device for great photos and videos. It is especially good if you want a lovely camera for HD videos without the fuss of editing and shooting. The stylish camera makes an attractive companion for events and travel. Here’s another spectacular pocket camera from the image and optical gurus, Canon. The Powershot SX720 combines an amazing 20-megapixel sensor with a 40x zoom range to give you the perfect memories for vacations, parties, and events. The long zoom range compact camera is versatile as it allows you to capture close images and distant landmarks with ease. You can further share your precious memories with friends and relatives via Wifi and NFC. The SX720 is nothing short of spectacular. While there are many brands out there, this one stands out with stunning features and great efficiency. The powerful optical zoom with Intelligent IS creates high quality, shake-free images. The most impressive feature must be the impressive zoom range that allows you to take photos in the field or on a rooftop yet still capturing the tiniest of details. To expound on the Intelligent IS, here is a breakdown of its amazing capabilities. Its Dynamic IS is perfect for shooting videos and images at wide-angle focal lengths while eliminating the unwanted shaking that is likely to happen when moving. Macro Hybrid IS corrects motion blurs in videos while the active tripod IS covers up for slight camera shakes for image stabilization. Do you enjoy making a few artistic changes to your images? SX720 comes with a unique creative shot feature that allows you to be inventive with the color, lighting, and composition for more personalized pictures. This is a superior compact camera, but it lacks a RAW shooting and a touchscreen. It is expected that the camera would have such features to keep up with its counterparts. Further, it has poor AF in low lighting. This is one of the best pocket cameras in 2018 as it is well-crafted with a long 40x zoom range in a slim, sleek and pocketable design. Admit it. You knew that the top ten best pocket cameras would not be complete without the mention of the tech giant, Sony. And you are right. The company has amazing compact cameras, but today we chose the Sony Cybershot RX100 for several reasons. Whether you are a pro or a point and shoot camera enthusiast, the RX100 delivers excellent quality at a not-so-friendly price. Retailing at $998, the compact camera is the most expensive pocket camera on our list. Its advanced features might justify its hefty price. We sought to find out what the RX100 is all about in our detailed review. The Sony RX100 is an advanced camera with 1.0 type sensor. This allows you to capture more detail. Unlike some of the pocket cameras that have impressive features but fail to deliver in low light, the RX100 is a stunning compact camera that gives you high-quality images even in poor lighting. Whether it is dusk or dawn, or anywhere in between, you can rely on the RX100 to give you clear, natural results. The wide ISO range from 125 to 6400 does a great job at ensuring you get the best images. You further get to choose between Auto ISO for the right setting, or you can tweak it yourself. The three step process to getting a great shot. It has a lens with a wide aperture for a bigger picture of the shot. Second, the 20.2 megapixels CMOS sensor captures a great image. The powerful processor provides smooth detail with exceptionally low noise. 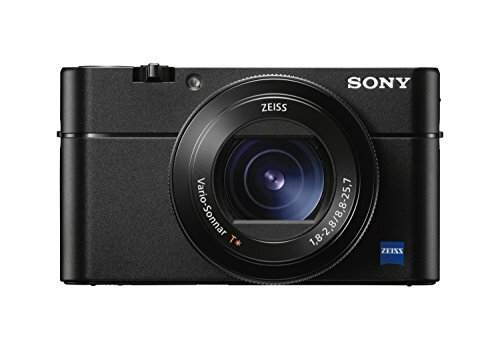 Crafted with aluminum, the RX100 has a sleek, compact design that is pocketable. Here’s a camera with an LCD screen that you can see in sunlight. For high contrast, the LCD uses WhiteMagic. You can change the settings using the Lens. This includes adjusting aperture, zoom, exposure and more. RX100’s built in control dial allows you to make changes fast. We have chosen the RX100 because of its continuous shooting speed. Its high-speed image processor powers fast shooting up to 10fps while generating clean and natural pictures. The RX100 has wowed us with every single detail except one, or is it two? First, the zoom range leaves little to be desired. At 3.6x, the compact camera is doing poorly when compared to its peers. Another disappointing feature would be that it lacks a touchscreen. Despite the few cons, the RX100 is one of the greatest large sensor compacts of its time. You can get more of this with better improvements with the RX100 II. Representing Nikon in the best pocket cameras for 2018 is the P900. It is nothing short of spectacular. With an awe-inspiring 83x zooming power, the Nikon P900 is a legend in our list. We have it as our best optical zoom pocket camera, and it is with no doubt, undisputed. The grand P900 is packed with features that translate to great images at every shot. Imagine a camera with 166x dynamic fine zoom and a Dual Detect Optical VR for amazing pictures. To top the great zoom range, the P900 has a full manual exposure control that allows you to be the boss of your images. If you like to take the lead and navigate some of the controls, you will find that feature extremely useful. A complaint registered with a number of some otherwise-incredible compact cameras is the lack of a viewfinder. You’ll be glad to learn that it is not the case with the amazing P900 as it has a high-resolution eye-level viewfinder. With our shared devices, it gets quite cumbersome to remove the memory card for video or photo sharing. Thankfully, the P900 comes with inbuilt Wifi and NFC for easy sharing among your devices. We have praised the P900 enough. Let’s look deeper to see what the small camera is loaded with before making our final verdict on its suitability, shall we? Enhanced digital zoom function, with 83X zoom and dual detect optical VR, to capture spectacular images. Wirelessly share images and videos with compatible devices using WiFi and NFC. Compose great shots with the high-resolution viewfinder and Vari-angle display. Low-light 16MP CMOS lens to take striking images. Full manual control for those who find this useful and a simple point to shoot feature for easy shooting. Built-in GPS and Points of Interests that record the precise location where shots were taken. Great for photo journals. Comes with rechargeable Li-ion batteries. Overall, the P900 is a majestic compact camera that will produce great images. Despite having an acceptable 16-megapixel sensor, it does not have RAW shooting which is a big deal to anyone who knows their way around a camera. Notably, there is an inconsistency with the color balance which is downright frustrating when trying to get the perfect shot. Having weighed the good and the bad, we feel that the P900 is a splendid camera that is worth its price tag. It may not measure up to its peers when it comes to some features, but it surely compensates with an impactful zoom range and the built-in GPS feature. 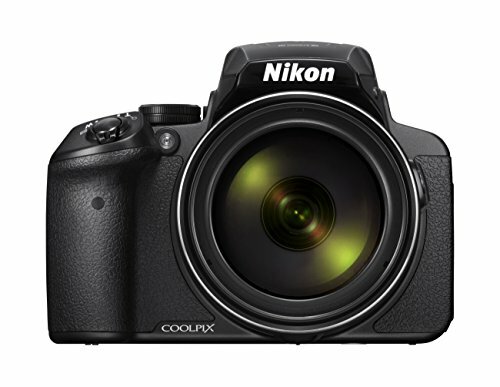 The Nikon CoolPix B500 is our editor’s choice for this review. Read on to find out why. Nikon B500 is an affordable superzoom camera with a powerful lens, 16mp CMOS sensor and Snapbridge wireless connectivity. It is designed for both simplicity and versatility. Let’s see more of its features to judge if it is indeed worthy of the high customer reviews. Capture high-resolution images using the 16.0mg low light CMOS sensor. The Nikkor ER glass lens boasts of a 40x zoom with an extra 4x digital zoom that doubles up the zoom range to 80x when used simultaneously. It has a 3” tilting LCD display for easy viewing and navigation. A striking Lens-Shift VR technology for shake-free images. A wide range of scene modes including close up, panorama, bird watching, portrait, night landscape and sunset. The 7.4fps burst shooting speed allows for continuous shooting mode. Preset and Auto white balance controls for natural tones under varied lighting conditions. Built-in auto flash that helps when there is poor light exposure. An excellent autofocus speed with contrast-detect. Get convenience with the built-in WiFi, NFC, and Bluetooth for instant connectivity. Includes the Snapbridge app that helps with remote shooting. The B500 is a stunning pocket camera, but it lacks a few essential features. First, it does not have a built-in viewfinder and lacks RAW shooting. It further lacks manual exposure and focusing, so you will not find it worth your money if you want a camera that allows you to be the boss sometimes. It lacks a touchscreen and an external flash. Also, the batteries are just horrible. AA batteries do not last long and this is why the newer models come with rechargeable Li-ion batteries. This is a great camera with a reasonable price tag. It is great for a beginner or someone who wants the basic point to shoot camera. A seasoned photographer will not particularly enjoy its lack of a viewfinder, RAW shooting, manual exposure and a flash. You might not want to pick this one from the shelf if you plan on shooting all day because the batteries will disappoint you. The Sony DSC-H300/B is not your everyday point and shoot camera. Packed with a powerful 35x zoom and 20.1mp sensor, the camera brings your subject closer for beautiful and precise photos. Its DSLR-style body makes it comfortable for shooting and recording. With extra features for creativity, you will find the Sony an absolute delight. How about we look into the features and specifications of the H300/B for more details. An impressive 35x optical zoom that brings your subject to you for clear, more detailed pictures. A 20.1mp CCD sensor that guarantees you beautiful photos at every shot. Its clarity and vibrant color are awe-inspiring. Easy HD recording at 720p. Get high-quality home videos at the touch of a button. The H300/B is perfect for fast editing as it has a speedy 30 frames per second. A solid DSLR-handling for a comfortable grip when shooting, recording and any handling. Take truly panoramic pictures with one shot. You simply press the 360-degree Panorama button, and it allows to capture a series of frames for a panoramic view. With Optical SteadyShot, you can counter unwanted movements and shakes for blur-free shots. Four built-in effects for creativity. You also get to flatter your subject with an automatic function that correct blemishes. You’ll be glad to learn that the reasonably-priced H300/B has very little to complain about. It is a basic point to shoot camera that has limited manual controls. If you are looking for something more advanced, you might keep off this one. The H300/B is ideal for simple image shots and video recording. The H300/B is a marvelous pocket camera. Loaded with great features, the compact camera is ultra-intuitive and efficient. It does all the work for you. If you are looking for a simple, easy-to-use pocket camera under $200, the H300/B is your best bet. An improvement from the LX100, the LX100S comes in the same sleek and stylish design but more advancements from its predecessor. The Lumix LX series is designed to inspire creativity. With full manual control, you get to play around with the exciting range of advanced imaging as you wish. You can exercise direct control when using the lens rings and dials. Its 16.8-megapixel sensor isn’t the grandest we have seen in our review, but it sure is adequate. Combined with the micro four thirds sensor with multi-aspect ratios, the camera makes a suitable companion for richer, natural images. Note that the multi-aspect ratio function can record images in a 4:3, 3:2 and 16:9 aspect ratio. Dubbed the best pocket camera with Leica Lens, the LX100s has a great lens and compact body. F1.7-2.8 brightness, crisp detail, and high speed make the Leica Lens system quite desirable. The lens consists of a number of elements in eight groups with five aspherical lenses that work seamlessly with Panasonic’s centering technology for enhanced alignment sharpness. Its striking instantaneous speed of 0.14 seconds takes advantage of the DFD technology that slashes focus time. Impressive much? Scroll further to find out more about the LX100S. An approximate 393g with the battery and SD card in place. This is a light, pocketable camera. The LX100S has five aspherical lenses, eight aspherical surfaces, 2 ED lenses. It takes advantage of the Leica DC lens for an interesting Bokeh defocus effect. 3.1x zoom range. Not very impressive, is it? When compared to others in this category, this is one of the shortest zooms. You might not want to take this to the mountain top. An extra optical zoom of 4.3x and an intelligent zoom of 6.2x. Still not impressed? Me neither. A 4x digital zoom that can double up if used with the intelligent zoom. Power O.I.S for optical image stabilization. An on and off Assist Lamp. AF metering with face and eye detection. A viewfinder exists in the LX100S. 0.38” LVF and Field of View of approximate 100% magnification. Clear and stable framing thanks to the 2,764k-dot EVF. 30p Ultra HD video and 4K photo mode. The LX100S is a splendid camera with few downsides. One of them is that its zoom range leaves a lot to be desired. It further has no tilt angle screen and lacks a touchscreen. Legendary LUMIX LX Series with manual controls -- Designed to Inspire Creativity. Lens: null/LEICA DC VARIO-SUMMILUX/11 elements in 8 groups/(5 Aspherical Lenses/8 Aspherical Surfaces/2 Dual-sided Aspherical Surface ED Lenses). 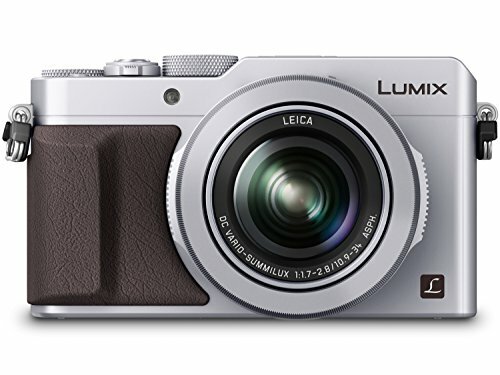 Despite the below-average zoom range, and its lack of a touchscreen and a tilt-angle screen, the Panasonic LX100S is a great bargain. It has a great lens and extra flash for high-quality photos and videos. Definitely worth buying. There are lots of pocket cameras flooding our market today. If you are new to the scene, you might be overwhelmed and confused on what brand to buy. The newer models are more compact and light as compared to their predecessors. Tips on buying the best pocket camera. Every year, new advancements in tech unravel much more convenience and ease of use. This is especially so in the compact camera scene. Do not purchase an older model when there is a newer, enhanced pocket camera in the market at a similar price. Conduct some research before rushing to the store for your imaging solutions. If you are new to the compact camera scene, you might not be too picky on the specs. Any simple camera will do. Have you thought of the purpose of your purchase? If you’re planning a safari, a camera with a good zoom range would be ideal to capture images at a distance. If you are a camera enthusiast with a little more sophisticated taste, check out the lens, sensor and extra features that give you outstanding images and videos. You might easily miss this feature as our review reveals that most of the models lack it. You want to see what you are shooting clearly and to avoid the light from creeping into your images thus ruining them. If you print the images, the sensor will be an important factor you must not overlook. It will give you better images when they are scrutinized. Anything 1/1.7in, 1in, and micro four thirds will work just great. Whether you are a camera enthusiast, a travel junkie or a pro photographer, you recognize the value a good pocket camera adds to your life. Besides being handy devices that will capture your precious memories in an impactful way, they come packed with features that only make life easier. You can barely compare the optical zoom and resolution of a smartphone’s camera to a pocket camera’s. Though their entry into the market spelled doom for the small but mighty pocket camera, phones have been unable to outshine the compact camera. Instagram, Snapchat, and other social media accounts have played a significant role in diversifying the need for great shots. From everyday snaps to pro shots, social media helps people connect in an unfathomable way. Sometimes, this is possible using only shots, and it would explain why some companies reap great benefits from their Instagram accounts. The pocket camera is a wonderful travel companion. It makes a fantastic sizeable shooting buddy for everyday pictures for social media. It turns simple images into works of art. Grab one of these spectacular pocket cameras and join the world in its photo-taking craze.